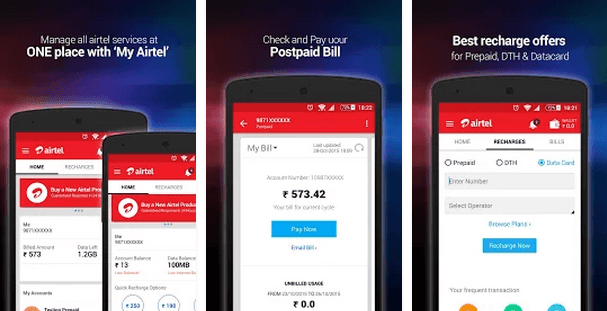 Bharti Airtel, one of the largest cellular operators in India, has released an update for the “My Airtel” application on Android. Unlike other operators, Airtel pays much heed to its self-care apps. It works towards making its applications more convenient for users, by introducing new features from time to time. Few weeks ago, the company changed the user interface of the “My Airtel” app. It also integrated wallet features into the app by providing support for ‘Airtel Money’ within it. Taking the changes the further, Airtel has also added features such as sharing talk time and internet benefits. It means that Airtel customers can also share talk time and data with friends and family who are on the same network. Moreover, Airtel has also enabled customers to assign their favorite songs as ringtones or HelloTunes from the app. The company has also extended VAS support within the app. If you are an Airtel user, then you can head to the Google Play Store for updating the ‘My Airtel’ app. Do you use the “My Airtel” app? If yes, then hit the comment section below and share your experience after the update. In some place there are Network congetion till date but as the tariff I never port Aircel, But in the question of Airtel there is another Player Vodafone always as my option of 2nd sim. I agree with Madhan. Every recharge website has stop giving offers for Airtel numbers because their looting genes not allowing anyone to earn. They want to promote their own website and App and have stopped or reduced commision of recharge portals i.e why Freecharge, Paytm, Mobikwik and many have stopped giving cashback offer for Airtel customers. Due to this more than 50 connection in my circle have ported to Vodafone or Idea. Postpaid customers also ported. The way I am facing problem with Airtel My Account, I will straight away request my friend to port to Vodafone. It’s good that you get the benefits directly from the operator and not from the 3rd party apps/ websites. Why do you favor 3rd party apps is not understood. because the benefits of 3rd party websites are much more then the operator itself in terms of cash back and convenience. Third party is more preferable for offer.